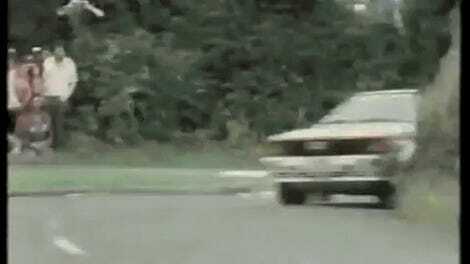 You’re watching the rarely-seen Mitsubishi Starion Turbo of Finns Lasse Lampi and Pentti Kuukkala at the 1000 Lakes Rally back in 1987. As you can see, they crash directly into a tree. In most racing, you would stop. But this isn’t most racing. This is rally. The term for this in rally is “press on regardless.” If you can keep going down the road, down the road you go. If one of your back wheels has been so busted out of shape that you’re crab-walking down the whole course, so be it. That’s what Lampi did at that rally, amazingly getting the car repaired at service. Once more we have proof both that rally drivers are pretty much the world’s best, as are rally mechanics. This car achieved some good results outside the offical WRC events (most notably Pentti Airikkala in the BRC) inspiring Mitsubishi to boost more for rallying (Galant VR-4, Lancers) In WRC events the car might be best remembered from Lasse Lampi hitting a tree on the 1st stage of ‘87 1000 Lakes rally. Miraculously they got car repaired at sevice and continued the rally. All these clips ar from the 1000 Lakes rallies in 1987 and ‘86. Keep this all in mind when you think about rally next. It’s not just the kind of racing where you’re flying sideways past trees at a hundred miles an hour, it’s the one where you also crash and then keep going, too.